We produce contracted external preparations that deliver drugs through the skin, ranging from poultices and tapes, to ointments, creams and fluid agents. 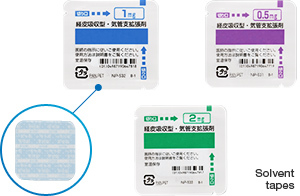 We support the production of high-performance and high-functional external preparations, utilizing our production technologies systemic transdermal absorption agents (TTS), where the drug is delivered through the skin, and for external products that are gentle on the skin and have excellent adhesiveness. 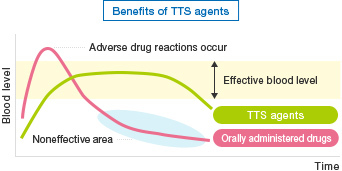 We have technologies for producing TTS agents, where the drug is delivered through the skin to the systemic blood circulation, thereby reducing adverse drug reactions and promoting high efficacy. Our technology achieves high skin permeability while combining secure attachment to the skin and ease of removal. Based on these technologies, we also provide support to customer companies in the development stage. Our support includes lifecycle management (LCM) strategies for developing external preparations for existing orally administered drugs as well as other services. 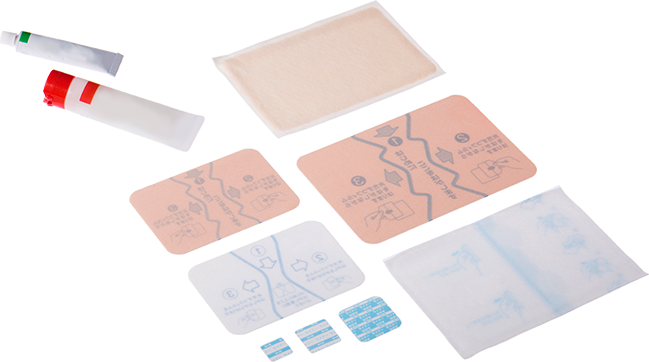 Utilizing our acrylic acid adhesives, we develop and produce solvent tapes with high added value that are gentle on the skin and have excellent adhesiveness. Our hot-melt tapes that utilize rubber adhesives tightly fit to movable body parts with high adhesiveness and rarely peel off, even during the hot summer months. We make suggestions for ideal production methods in accordance with how the product will be used.